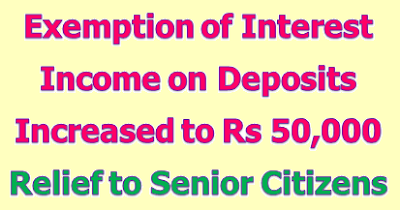 With the objective of providing a dignified life to senior citizens, the Union Minister for Finance and Corporate Affairs, Shri Arun Jaitley, announced significant incentives for senior citizens. Presenting the General Budget 2018-19 in Parliament here today, the Finance Minister said that the exemption of interest income on deposits with banks and post offices to be increased from Rs. 10,000/- to Rs. 50,000/- and TDS shall not be required to be deducted on such income, under section 194A. 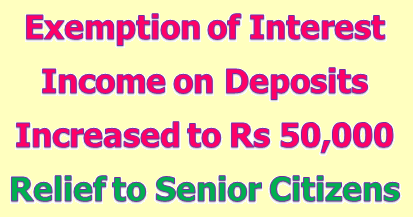 This benefit shall be available also for interest from all fixed deposits schemes and recurring deposit schemes. The Finance Minister also announced raising the limit of deduction for health insurance premium and/ or medical expenditure from Rs. 30,000/- to Rs. 50,000/-, under section 80D. All senior citizens will now be able to claim benefit of deduction up to Rs. 50,000/- per annum in respect of any health insurance premium and/or any general medical expenditure incurred.